I wanted to share a quick update AND provide a place (and motivation!) for you to share your updates. But first, I have a little secret to tell. I started my challenge a few weeks before posting the original blog post. I wanted to test drive the idea ahead of time to make sure it really motivated me as I hoped it would. I have just a few days left in my challenge, and guess what? It has really worked for me! Somehow just knowing I would be reporting my progress out here on the blog, even if not immediately, really helped me push through the discomfort of some of these tasks. I found myself incredibly motivated to check stuff off the list, even big tasks that took hours (okay, maybe a whole day!) to complete. A great example was culling through my emails and unsubscribing from the many, many lists that PR Companies have added me to, as well as lists that no longer are relevant to me and my life. It was a slow, painful process, with a huge reward at the end! I literally went from thousands of emails in my Gmail promotions tab down to less than 100! OMG, that felt so good! I also found myself pushing through tasks I would normally delay finishing. For example, the other night I was at Home Goods to buy our new puppy a bed. I remembered that in order to complete my “frame pictures” task, I needed to pick up some picture frames. As I was looking at the frames I was having trouble deciding on the perfect frames, so I was tempted to leave the store empty-handed and think about it for a while. But, I knew my Check-It-Off Challenge deadline was quickly approaching and I wouldn’t have time to get back to Home Goods before I was out of time. So, I picked out four frames and headed to the checkout lane knowing I had just earned myself another “Check-It-Off Challenge” checkmark. Woohoo! So there you have it, my Check-It-Off Challenge update. How’s yours going? I’d love to hear in the comments below! 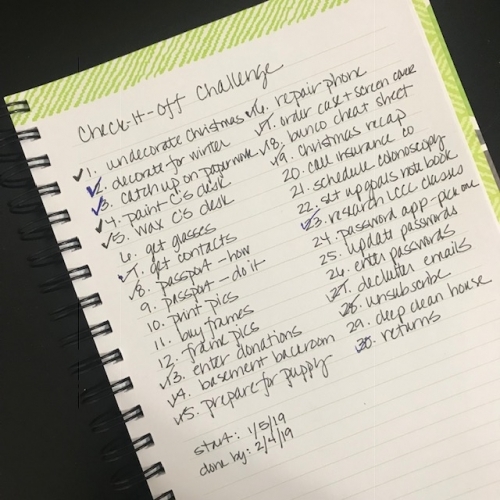 A family issue derailed me for several days but yesterday, when I was trying to catch up on some errands, I was able to bundle a couple of tasks on my list onto them so I still got the pleasure of crossing items off my list. Plus one of my challenges was to call a relative who had offered to help me with some household tasks. He called me! Then he came and did them! I didn’t do the more dreaded tasks I’d been planning, but I will try to face those down this week. You’re doing great Nancy! Love that your relative called you instead of the other way around. Funny how that can happen sometimes just when we need it! Good luck on the dreaded tasks this week. I hope they turn out to be less dreadful in the real world than they are in your mind. I’ve surprised myself by how much I’ve accomplished these past few days just by participating in this challenge. I’ve knocked out 11 of my 38 items, a few were easy “just do it, why did I put this off for so long” items and others took some serious effort (like deciding how to organize my notes; I’ve settled on a plan and will give it a try). Thanks Aby! I hear you on the “why did I put this off for so long” items. I had a bunch of those. Funny how our brain builds up resistance that is out of proportion to the actual task, isn’t it? Nice work, too, on coming up with a system to try for your notes. Woohoo! Way to go Linda! Exciting to hear about your progress. The one item per day approach is terrific! Keep it up. But have the next three days pretty much at home …. so should be able to get to tick off a few ! How’s your challenge going Kathryn? I was struggling to make a list until I broke things down into smaller tasks. I didn’t realize how much the lack of starting point was holding me back. I also realized that I’ll be on vacation on for a week of the challenge, so I’m adding on an extra week to my deadline. I’m currently 7/30, with some progress toward a few more items. As an added bonus, I got through my paper backlog today! That wasn’t on my list, but several other items were related to papers in the pile. Nice job Stephanie! 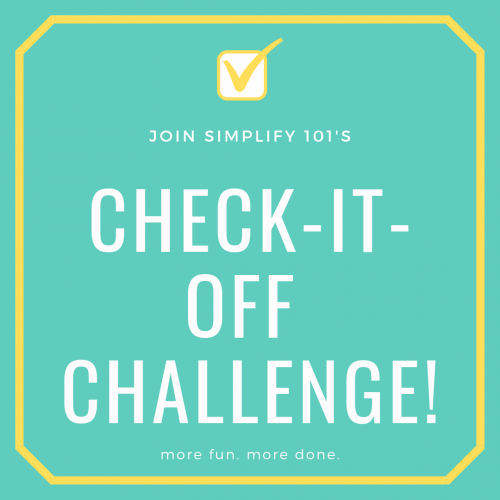 I love that you simply added a week to the challenge due to your vacation instead of not doing it at all! Aby, You have my admiration for accomplishing so many onerous tasks in such a short time. How did you manage to change all of your passwords? Is a password app secure? Not sure how that would work. This is something I need to do too. Thank you for your inspiration. I’ve been ticking away at my huge list (more than 31 things). My problem, though, is knowing that doing one thing means ignoring the others. Yes, that’s the only way to move forward, but am feeling discouraged. Such a good point that one thing done means ignoring the others, but that truly is the way to get things done, one thing at a time. So it’s always that way just without a list you may not be focusing on the most important things. Did you prioritize your list? That might help alleviate the worry over what is being ignored if you feel confident you’re working on the most important things. I am feeling discouraged too but trying to regroup. I lost many days to a renewed family emergency, then catching up on work etc, so I had a period of not attending to my list. I lost my my momentum. Then I had some unexpected difficulties with some of the tasks I did manage to start….But I’m slowly getting back into it. A nice aspect of having the list is that in reviewing it I reminded myself of how much I’d done before I got derailed, and also seeing that I’d made a bit more progress than I’d realized during my “off” time–several items started, if not finished, so that’s good. Anyway, the list is still very helpful and motivating and I will keep chipping away at it. Unfortunately, the more time that passes, the more new items have to get added! I’m so sorry to hear about the family emergency, Nancy. Times like that always take a toll on our productivity. I’m happy that your list is proving as a source of encouragement as you’re able to see how much you can accomplish during more normal circumstances. Hang in there!! I started okay but fizzled. On the plus side, I accomplished more than I would have without the challenge. And technically I have a couple days left (I set my deadline as Feb 28) so I might stil get another thing checked off, though I’m not holding my breath. That’s a great way to look at it – that you accomplished more than you would have without the challenge! How did the final days go? I also achieved a lot more than I would have done without the support of this challenge, Aby – and thank you again for catalysing this, and holding the space. And in my home – many more clear spaces, clarified zones, and shifts that had been on my vague list for long time. I still aim for more, before this phase of transformation will feel complete, and wonder if you are aiming to have this as an ongoing project now? I will likely keep on with clearing in the coming weeks anyway – the habit is definitely reawakened. Even the paperwork is beginning to shape up again. : ) Big triumph.